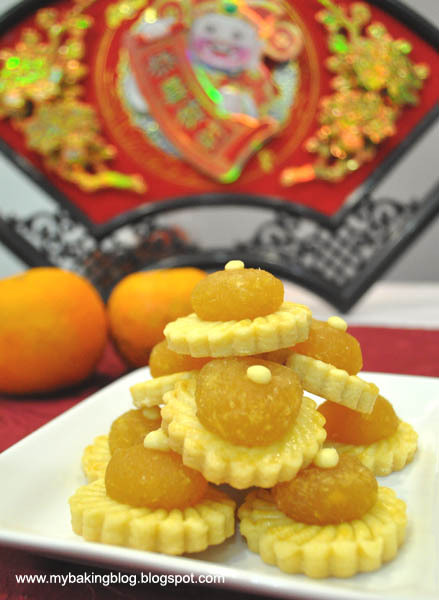 My Baking Blog: Ong Lai Tart (aka Pineapple Tarts) - Huat Ah 2011! So, Chinese New Year is just over - the last day was yesterday. Wait a minute, why am I always late? I post about christmas after christmas, I post about New Year after New Year and now.....it's just beginning to become so like me to be late for my posts. Anyway, I had been making making pineapple tarts for friends and relatives. Pineapple tarts are very important, because they signify prosperity. Everyone wishes for great abundance and prosperity in the year to come. For me, other than my waistline (and my hips too haha), I wish I will prosper in all other aspects. This is how my tarts look like this year and probably will still look like for next year. If you read my post 2 years back on those tarts, you'll see that these tarts look kinda "naked" without the criss-cross strips on top. But what the heck, I'm making them in a much larger quantity this year, so those time-consuming strips have to go!